Party on with Margarita Shrimp and Vegetable Kabobs. Real tequila gives these Margarita Shrimp and Vegetable Kabobs their great summertime flavor! If you wanted to serve them alongside a real margarita, that'd be fine by us! Mix dressing mix, oil, tequila and lime juice until well blended. Pour over shrimp and vegetables in shallow dish; cover. Refrigerate 30 min. to 2 hours to marinate. Remove shrimp and vegetables from marinade; discard marinade. Preheat grill to medium-high heat. 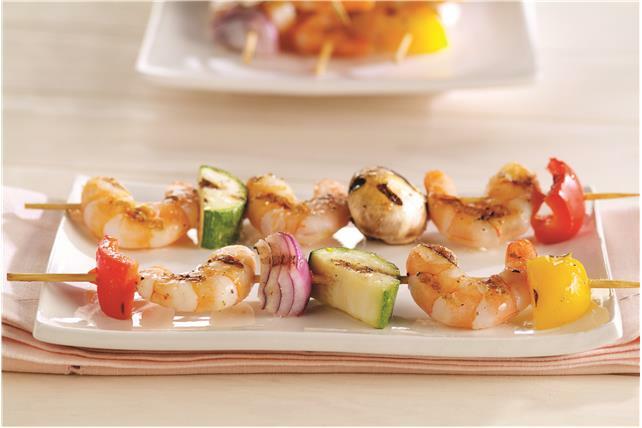 Arrange shrimp and vegetables on skewers. Grill kabobs 5 to 8 min. or until shrimp turn pink and vegetables are crisp-tender, turning after 4 min.